Sweet Home 3D is a popular floor plan design software that allows you to draw your home or office plan and visualize it in 3D perspective. 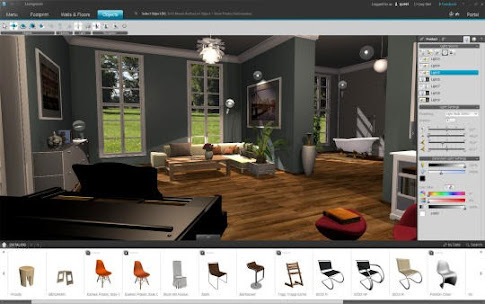 Sweet Home 3D designer was developed to be a cross platform floor plan creation and interior design software, which has designed specifically for home architectural design, that also helps users plan their home interior decoration and landscape. You can draw a floor plan with accurate wall measurements, place doors and windows, decorate rooms with furniture and design the outside with exterior objects and finally experience the floor plan design with interactive 3D walkthroughs. Sweet Home 3D Designer always been a reliable floor plan and interior designing application for real estate professionals. It provides all the essential architectural tools and home decoration features that makes easy for the user to create a new home design or renovate a floor plan. With this home designing software, you can easily create a different type of floor plans, with multiple floor levels and print or export it in different file formats. You can easily create Floor plans, House plans, Landscapes, Decks, Kitchens, Bathrooms, Office spaces, Facilities, and more. Download free Sweet Home 3D (Windows, Mac, Linux). 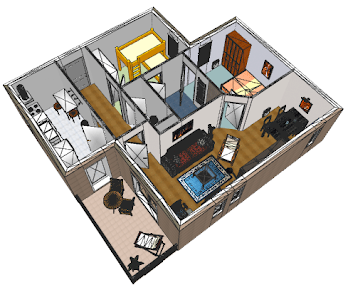 Read more about Sweet Home 3D floor plan and interior design software. Floorplanner is a web-based floor plan designing software to make beautiful floor plans and view your plans in 3D. With Floorplanner designing software you can design your home plan plan layout and interior design with furniture. Every item can be reshaped, resized and rotated, giving you exactly the floor plan you want. Floorplanner has the right tools for you, If you're moving into a new house, planning a wedding, or reorganizing your living room. With Floorplanner you can recreate your home, garden or office in just a few clicks and furnish your plans with Floorplanner’s huge library of objects. Floorplanner also offers more paid features for professional home designer. Roomeon is a cloud-based full featured free 3D floor plan designing application which makes it totally easy to design your home layout and rooms interior just by drag & drop. Roomeon runs on your computer and it connects with its large online catalog for furnishing and fittings and 3D objects. You will be able to download use floor plans from its shared templates collection. Roomeon 3D home design application provides all the necessary home designing tools and features and it is ideal for interior designers, architects, and anybody else who wants to design floor plan. It allows you to design 3D rooms in photo-realistic quality from individual floorplan of your room to the dot. Roomeon background image-function lets you copy any draft at ease. Simply upload the image, and draw over it. Its easy-to-use tools let you adjust height, size, and length as well as the thickness of walls. Download free Roomeon home and interior design application for Windows and Mac OS. RoomSketcher Home Designer is a incredibly easy to use web-based home plan design application developed for real estate professionals that will be also handy for regular homeowners. With its drag-and-drop user interface, drawing floor plans and placing furniture is extremely simple. Simply draw your floor plans yourself or scan your blueprints and let a RoomSketcher illustrator create a floor plan for you. You can create 2D Floor Plans, 3D Floor Plans, and visualize your floor plans in interactive 3D walk mode with a click of a button. RoomSketcher gives its user four simple floor plan designing steps. First to design floor plan layouts with walls. Select wall size and drag and draw with your mouse, RoomSketcher will preview wall size feedback to keep the measurement accuracy right. In the second step, you can add doors, windows, and stairs in your floor plan. In Materials section, you are able to choose wall and floor texture and color. Simply drag and drop a material (paint, wallpaper, wood, brick, tiles, stone stab) on a room and it will give you the option to which side of the wall or floor you want to apply that material. And finally, decorate your home interior with furniture using Room Sketcher planners furniture collection. You can use any items in your home interior by choosing from a large collection of categorically organized furniture. 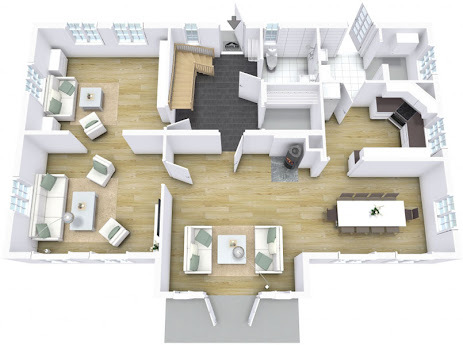 RoomSketcher’s 2D & 3D floor plans provide a clean and simple visual overview of the property so that potential homebuyers can clearly see the layout and visualize the home design for better understanding. 2D floor plans are delivered in monochrome or color, furnished or unfurnished, with measurements or without. You can save floor plan in your free RoomSketcher cloud account, so you can share your completed floor plans online, add them to your website or share with social media – to make all your real estate listings stand out. You can design your home plans in free browser-based RoomSketcher Home Designer application or download its Windows desktop version from RoomSketcher website. 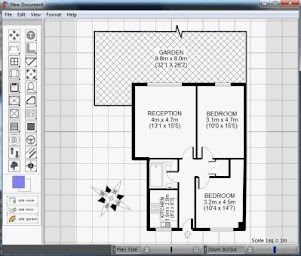 myFloorplan Designer is a free easy to use a simple vector-based 2D floor plan designing tool that was developed to draw home floor plan layouts. myFloorplan has been specifically designed for quick and accurate floor plan designing that will provide you all the necessary layout, object and measurement tools. You can easily draw rooms layout with walls, add different types of doors and windows and furniture. myFloorplan furniture and objects are available for bedroom, bathroom, kitchen and outdoor. myFloorplan Download free myFloorplan. Flash Floor Plan is a simple customizable dynamic drag and drop Flash application that facilitates room layout planning tool for website. In Flash Floor Plan, furniture is loaded into a palette through a simple XML file, and can then be dragged and dropped onto a floor plan. The floor plan can be zoomed in and out, and furniture items can be rotated, moved, and deleted. It is the perfect solution for realtors, condos, or any property sales related marketing website. Download free open source Flash Floor Plan.